For the scientific journal, see Geology (journal). Geology (from the Ancient Greek γῆ, gē ("earth") and -λoγία, -logia, ("study of", "discourse")) is an earth science concerned with the solid Earth, the rocks of which it is composed, and the processes by which they change over time. Geology can also include the study of the solid features of any terrestrial planet or natural satellite such as Mars or the Moon. Modern geology significantly overlaps all other earth sciences, including hydrology and the atmospheric sciences, and so is treated as one major aspect of integrated earth system science and planetary science. Aerial view of Grand Prismatic Spring; Hot Springs, Midway & Lower Geyser Basin, Yellowstone National Park. Geology describes the structure of the Earth on and beneath its surface, and the processes that have shaped that structure. It also provides tools to determine the relative and absolute ages of rocks found in a given location, and also to describe the histories of those rocks. By combining these tools, geologists are able to chronicle the geological history of the Earth as a whole, and also to demonstrate the age of the Earth. Geology provides the primary evidence for plate tectonics, the evolutionary history of life, and the Earth's past climates. Geologists use a wide variety of methods to understand the Earth's structure and evolution, including field work, rock description, geophysical techniques, chemical analysis, physical experiments, and numerical modelling. In practical terms, geology is important for mineral and hydrocarbon exploration and exploitation, evaluating water resources, understanding of natural hazards, the remediation of environmental problems, and providing insights into past climate change. Geology is a major academic discipline, and it plays an important role in geotechnical engineering. The majority of geological data comes from research on solid Earth materials. These typically fall into one of two categories: rock and unlithified material. The majority of research in geology is associated with the study of rock, as rock provides the primary record of the majority of the geologic history of the Earth. There are three major types of rock: igneous, sedimentary, and metamorphic. The rock cycle illustrates the relationships among them (see diagram). When a rock solidifies or crystallizes from melt (magma or lava), it is an igneous rock. This rock can be weathered and eroded, then redeposited and lithified into a sedimentary rock. It can then be turned into a metamorphic rock by heat and pressure that change its mineral content, resulting in a characteristic fabric. All three types may melt again, and when this happens, new magma is formed, from which an igneous rock may once more solidify. Luster: Measurement of the amount of light reflected from the surface. Luster is broken into metallic and nonmetallic. Color: Minerals are grouped by their color. Mostly diagnostic but impurities can change a mineral’s color. Streak: Performed by scratching the sample on a porcelain plate. The color of the streak can help name the mineral. Hardness: The resistance of a mineral to scratch. Breakage pattern: A mineral can either show fracture or cleavage, the former being breakage of uneven surfaces and the latter a breakage along closely spaced parallel planes. Specific gravity: the weight of a specific volume of a mineral. Effervescence: Involves dripping hydrochloric acid on the mineral to test for fizzing. Magnetism: Involves using a magnet to test for magnetism. 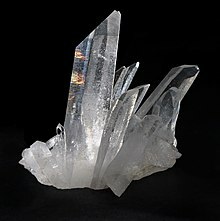 Taste: Minerals can have a distinctive taste, like halite (which tastes like table salt). Smell: Minerals can have a distinctive odor. For example, sulfur smells like rotten eggs. Geologists also study unlithified materials (referred to as drift), which typically come from more recent deposits. These materials are superficial deposits that lie above the bedrock. This study is often known as Quaternary geology, after the Quaternary period of geologic history. However, unlithified material does not only include sediments. Magmas and lavas are the original unlithified source of all igneous rocks. The active flow of molten rock is closely studied in volcanology, and igneous petrology aims to determine the history of igneous rocks from their final crystallization to their original molten source. 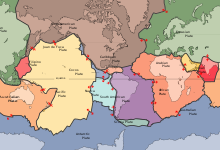 Oceanic-continental convergence resulting in subduction and volcanic arcs illustrates one effect of plate tectonics. The major tectonic plates of the Earth. In the 1960s, it was discovered that the Earth's lithosphere, which includes the crust and rigid uppermost portion of the upper mantle, is separated into tectonic plates that move across the plastically deforming, solid, upper mantle, which is called the asthenosphere. This theory is supported by several types of observations, including seafloor spreading and the global distribution of mountain terrain and seismicity. There is an intimate coupling between the movement of the plates on the surface and the convection of the mantle (that is, the heat transfer caused by bulk movement of molecules within fluids). Thus, oceanic plates and the adjoining mantle convection currents always move in the same direction – because the oceanic lithosphere is actually the rigid upper thermal boundary layer of the convecting mantle. 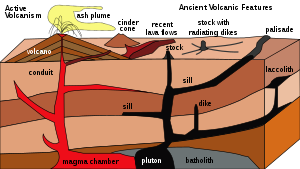 This coupling between rigid plates moving on the surface of the Earth and the convecting mantle is called plate tectonics. In this diagram based on seismic tomography, subducting slabs are in blue and continental margins and a few plate boundaries are in red. The blue blob in the cutaway section is the Farallon Plate, which is subducting beneath North America. The remnants of this plate on the surface of the Earth are the Juan de Fuca Plate and Explorer Plate, both in the northwestern United States and southwestern Canada, and the Cocos Plate on the west coast of Mexico. Mid-ocean ridges, high regions on the seafloor where hydrothermal vents and volcanoes exist, are seen as divergent boundaries, where two plates move apart. Arcs of volcanoes and earthquakes are theorized as convergent boundaries, where one plate subducts, or moves, under another. Transform boundaries, such as the San Andreas Fault system, resulted in widespread powerful earthquakes. Plate tectonics also has provided a mechanism for Alfred Wegener's theory of continental drift, in which the continents move across the surface of the Earth over geologic time. They also provided a driving force for crustal deformation, and a new setting for the observations of structural geology. The power of the theory of plate tectonics lies in its ability to combine all of these observations into a single theory of how the lithosphere moves over the convecting mantle. Seismologists can use the arrival times of seismic waves in reverse to image the interior of the Earth. Early advances in this field showed the existence of a liquid outer core (where shear waves were not able to propagate) and a dense solid inner core. These advances led to the development of a layered model of the Earth, with a crust and lithosphere on top, the mantle below (separated within itself by seismic discontinuities at 410 and 660 kilometers), and the outer core and inner core below that. More recently, seismologists have been able to create detailed images of wave speeds inside the earth in the same way a doctor images a body in a CT scan. These images have led to a much more detailed view of the interior of the Earth, and have replaced the simplified layered model with a much more dynamic model. Mineralogists have been able to use the pressure and temperature data from the seismic and modelling studies alongside knowledge of the elemental composition of the Earth to reproduce these conditions in experimental settings and measure changes in crystal structure. These studies explain the chemical changes associated with the major seismic discontinuities in the mantle and show the crystallographic structures expected in the inner core of the Earth. The geologic time scale encompasses the history of the Earth. It is bracketed at the earliest by the dates of the first Solar System material at 4.567 Ga (or 4.567 billion years ago) and the formation of the Earth at 4.54 Ga (4.54 billion years), which is the beginning of the informally recognized Hadean eon – a division of geologic time. At the later end of the scale, it is marked by the present day (in the Holocene epoch). Geological time put in a diagram called a geological clock, showing the relative lengths of the eons of the Earth's history. Cross-cutting relations can be used to determine the relative ages of rock strata and other geological structures. Explanations: A – folded rock strata cut by a thrust fault; B – large intrusion (cutting through A); C – erosional angular unconformity (cutting off A & B) on which rock strata were deposited; D – volcanic dyke (cutting through A, B & C); E – even younger rock strata (overlying C & D); F – normal fault (cutting through A, B, C & E). Methods for relative dating were developed when geology first emerged as a natural science. Geologists still use the following principles today as a means to provide information about geologic history and the timing of geologic events. The principle of uniformitarianism states that the geologic processes observed in operation that modify the Earth's crust at present have worked in much the same way over geologic time. A fundamental principle of geology advanced by the 18th century Scottish physician and geologist James Hutton is that "the present is the key to the past." In Hutton's words: "the past history of our globe must be explained by what can be seen to be happening now." The principle of intrusive relationships concerns crosscutting intrusions. In geology, when an igneous intrusion cuts across a formation of sedimentary rock, it can be determined that the igneous intrusion is younger than the sedimentary rock. Different types of intrusions include stocks, laccoliths, batholiths, sills and dikes. The principle of inclusions and components states that, with sedimentary rocks, if inclusions (or clasts) are found in a formation, then the inclusions must be older than the formation that contains them. For example, in sedimentary rocks, it is common for gravel from an older formation to be ripped up and included in a newer layer. A similar situation with igneous rocks occurs when xenoliths are found. These foreign bodies are picked up as magma or lava flows, and are incorporated, later to cool in the matrix. As a result, xenoliths are older than the rock that contains them. The Permian through Jurassic stratigraphy of the Colorado Plateau area of southeastern Utah is an example of both original horizontality and the law of superposition. These strata make up much of the famous prominent rock formations in widely spaced protected areas such as Capitol Reef National Park and Canyonlands National Park. From top to bottom: Rounded tan domes of the Navajo Sandstone, layered red Kayenta Formation, cliff-forming, vertically jointed, red Wingate Sandstone, slope-forming, purplish Chinle Formation, layered, lighter-red Moenkopi Formation, and white, layered Cutler Formation sandstone. Picture from Glen Canyon National Recreation Area, Utah. The principle of faunal succession is based on the appearance of fossils in sedimentary rocks. As organisms exist during the same period throughout the world, their presence or (sometimes) absence provides a relative age of the formations where they appear. Based on principles that William Smith laid out almost a hundred years before the publication of Charles Darwin's theory of evolution, the principles of succession developed independently of evolutionary thought. The principle becomes quite complex, however, given the uncertainties of fossilization, localization of fossil types due to lateral changes in habitat (facies change in sedimentary strata), and that not all fossils formed globally at the same time. The mineral zircon is often used in radiometric dating. Geologists also use methods to determine the absolute age of rock samples and geological events. These dates are useful on their own and may also be used in conjunction with relative dating methods or to calibrate relative methods. At the beginning of the 20th century, advancement in geological science was facilitated by the ability to obtain accurate absolute dates to geologic events using radioactive isotopes and other methods. This changed the understanding of geologic time. Previously, geologists could only use fossils and stratigraphic correlation to date sections of rock relative to one another. With isotopic dates, it became possible to assign absolute ages to rock units, and these absolute dates could be applied to fossil sequences in which there was datable material, converting the old relative ages into new absolute ages. For many geologic applications, isotope ratios of radioactive elements are measured in minerals that give the amount of time that has passed since a rock passed through its particular closure temperature, the point at which different radiometric isotopes stop diffusing into and out of the crystal lattice. These are used in geochronologic and thermochronologic studies. Common methods include uranium-lead dating, potassium-argon dating, argon-argon dating and uranium-thorium dating. These methods are used for a variety of applications. Dating of lava and volcanic ash layers found within a stratigraphic sequence can provide absolute age data for sedimentary rock units that do not contain radioactive isotopes and calibrate relative dating techniques. These methods can also be used to determine ages of pluton emplacement. Thermochemical techniques can be used to determine temperature profiles within the crust, the uplift of mountain ranges, and paleotopography. Fractionation of the lanthanide series elements is used to compute ages since rocks were removed from the mantle. Other methods are used for more recent events. Optically stimulated luminescence and cosmogenic radionuclide dating are used to date surfaces and/or erosion rates. Dendrochronology can also be used for the dating of landscapes. Radiocarbon dating is used for geologically young materials containing organic carbon. An originally horizontal sequence of sedimentary rocks (in shades of tan) are affected by igneous activity. Deep below the surface are a magma chamber and large associated igneous bodies. The magma chamber feeds the volcano, and sends offshoots of magma that will later crystallize into dikes and sills. Magma also advances upwards to form intrusive igneous bodies. The diagram illustrates both a cinder cone volcano, which releases ash, and a composite volcano, which releases both lava and ash. An illustration of the three types of faults. A. Strike-slip faults occur when rock units slide past one another. B. Normal faults occur when rocks are undergoing horizontal extension. C. Reverse (or thrust) faults occur when rocks are undergoing horizontal shortening. The San Andreas Fault in California. The geology of an area changes through time as rock units are deposited and inserted, and deformational processes change their shapes and locations. Rock units are first emplaced either by deposition onto the surface or intrusion into the overlying rock. Deposition can occur when sediments settle onto the surface of the Earth and later lithify into sedimentary rock, or when as volcanic material such as volcanic ash or lava flows blanket the surface. Igneous intrusions such as batholiths, laccoliths, dikes, and sills, push upwards into the overlying rock, and crystallize as they intrude. A diagram of folds, indicating an anticline and a syncline. Even higher pressures and temperatures during horizontal shortening can cause both folding and metamorphism of the rocks. This metamorphism causes changes in the mineral composition of the rocks; creates a foliation, or planar surface, that is related to mineral growth under stress. This can remove signs of the original textures of the rocks, such as bedding in sedimentary rocks, flow features of lavas, and crystal patterns in crystalline rocks. Extension causes the rock units as a whole to become longer and thinner. This is primarily accomplished through normal faulting and through the ductile stretching and thinning. Normal faults drop rock units that are higher below those that are lower. This typically results in younger units ending up below older units. Stretching of units can result in their thinning. In fact, at one location within the Maria Fold and Thrust Belt, the entire sedimentary sequence of the Grand Canyon appears over a length of less than a meter. Rocks at the depth to be ductilely stretched are often also metamorphosed. These stretched rocks can also pinch into lenses, known as boudins, after the French word for "sausage" because of their visual similarity. Where rock units slide past one another, strike-slip faults develop in shallow regions, and become shear zones at deeper depths where the rocks deform ductilely. Geologic cross section of Kittatinny Mountain. This cross section shows metamorphic rocks, overlain by younger sediments deposited after the metamorphic event. These rock units were later folded and faulted during the uplift of the mountain. The addition of new rock units, both depositionally and intrusively, often occurs during deformation. Faulting and other deformational processes result in the creation of topographic gradients, causing material on the rock unit that is increasing in elevation to be eroded by hillslopes and channels. These sediments are deposited on the rock unit that is going down. Continual motion along the fault maintains the topographic gradient in spite of the movement of sediment, and continues to create accommodation space for the material to deposit. Deformational events are often also associated with volcanism and igneous activity. Volcanic ashes and lavas accumulate on the surface, and igneous intrusions enter from below. Dikes, long, planar igneous intrusions, enter along cracks, and therefore often form in large numbers in areas that are being actively deformed. This can result in the emplacement of dike swarms, such as those that are observable across the Canadian shield, or rings of dikes around the lava tube of a volcano. All of these processes do not necessarily occur in a single environment, and do not necessarily occur in a single order. The Hawaiian Islands, for example, consist almost entirely of layered basaltic lava flows. The sedimentary sequences of the mid-continental United States and the Grand Canyon in the southwestern United States contain almost-undeformed stacks of sedimentary rocks that have remained in place since Cambrian time. Other areas are much more geologically complex. In the southwestern United States, sedimentary, volcanic, and intrusive rocks have been metamorphosed, faulted, foliated, and folded. Even older rocks, such as the Acasta gneiss of the Slave craton in northwestern Canada, the oldest known rock in the world have been metamorphosed to the point where their origin is undiscernable without laboratory analysis. In addition, these processes can occur in stages. In many places, the Grand Canyon in the southwestern United States being a very visible example, the lower rock units were metamorphosed and deformed, and then deformation ended and the upper, undeformed units were deposited. Although any amount of rock emplacement and rock deformation can occur, and they can occur any number of times, these concepts provide a guide to understanding the geological history of an area. A standard Brunton Pocket Transit, commonly used by geologists for mapping and surveying. Geologists use a number of field, laboratory, and numerical modeling methods to decipher Earth history and to understand the processes that occur on and inside the Earth. In typical geological investigations, geologists use primary information related to petrology (the study of rocks), stratigraphy (the study of sedimentary layers), and structural geology (the study of positions of rock units and their deformation). In many cases, geologists also study modern soils, rivers, landscapes, and glaciers; investigate past and current life and biogeochemical pathways, and use geophysical methods to investigate the subsurface. Sub-specialities of geology may distinguish endogenous and exogenous geology. 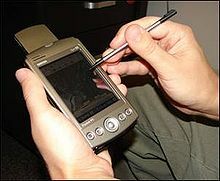 Today, handheld computers with GPS and geographic information systems software are often used in geological field work (digital geologic mapping). 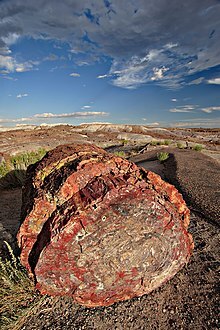 A petrified log in Petrified Forest National Park, Arizona, U.S.A. Structural mapping: identifying the locations of major rock units and the faults and folds that led to their placement there. A petrographic microscope – an optical microscope fitted with cross-polarizing lenses, a conoscopic lens, and compensators (plates of anisotropic materials; gypsum plates and quartz wedges are common), for crystallographic analysis. In addition to identifying rocks in the field (lithology), petrologists identify rock samples in the laboratory. Two of the primary methods for identifying rocks in the laboratory are through optical microscopy and by using an electron microprobe. In an optical mineralogy analysis, petrologists analyze thin sections of rock samples using a petrographic microscope, where the minerals can be identified through their different properties in plane-polarized and cross-polarized light, including their birefringence, pleochroism, twinning, and interference properties with a conoscopic lens. In the electron microprobe, individual locations are analyzed for their exact chemical compositions and variation in composition within individual crystals. Stable and radioactive isotope studies provide insight into the geochemical evolution of rock units. Petrologists can also use fluid inclusion data and perform high temperature and pressure physical experiments to understand the temperatures and pressures at which different mineral phases appear, and how they change through igneous and metamorphic processes. This research can be extrapolated to the field to understand metamorphic processes and the conditions of crystallization of igneous rocks. This work can also help to explain processes that occur within the Earth, such as subduction and magma chamber evolution. A diagram of an orogenic wedge. The wedge grows through faulting in the interior and along the main basal fault, called the décollement. It builds its shape into a critical taper, in which the angles within the wedge remain the same as failures inside the material balance failures along the décollement. It is analogous to a bulldozer pushing a pile of dirt, where the bulldozer is the overriding plate. Structural geologists use microscopic analysis of oriented thin sections of geologic samples to observe the fabric within the rocks, which gives information about strain within the crystalline structure of the rocks. They also plot and combine measurements of geological structures to better understand the orientations of faults and folds to reconstruct the history of rock deformation in the area. In addition, they perform analog and numerical experiments of rock deformation in large and small settings. The analysis of structures is often accomplished by plotting the orientations of various features onto stereonets. A stereonet is a stereographic projection of a sphere onto a plane, in which planes are projected as lines and lines are projected as points. These can be used to find the locations of fold axes, relationships between faults, and relationships between other geologic structures. Among the most well-known experiments in structural geology are those involving orogenic wedges, which are zones in which mountains are built along convergent tectonic plate boundaries. In the analog versions of these experiments, horizontal layers of sand are pulled along a lower surface into a back stop, which results in realistic-looking patterns of faulting and the growth of a critically tapered (all angles remain the same) orogenic wedge. Numerical models work in the same way as these analog models, though they are often more sophisticated and can include patterns of erosion and uplift in the mountain belt. This helps to show the relationship between erosion and the shape of a mountain range. These studies can also give useful information about pathways for metamorphism through pressure, temperature, space, and time. In the laboratory, stratigraphers analyze samples of stratigraphic sections that can be returned from the field, such as those from drill cores. Stratigraphers also analyze data from geophysical surveys that show the locations of stratigraphic units in the subsurface. Geophysical data and well logs can be combined to produce a better view of the subsurface, and stratigraphers often use computer programs to do this in three dimensions. Stratigraphers can then use these data to reconstruct ancient processes occurring on the surface of the Earth, interpret past environments, and locate areas for water, coal, and hydrocarbon extraction. In the laboratory, biostratigraphers analyze rock samples from outcrop and drill cores for the fossils found in them. These fossils help scientists to date the core and to understand the depositional environment in which the rock units formed. Geochronologists precisely date rocks within the stratigraphic section to provide better absolute bounds on the timing and rates of deposition. Magnetic stratigraphers look for signs of magnetic reversals in igneous rock units within the drill cores. Other scientists perform stable-isotope studies on the rocks to gain information about past climate. 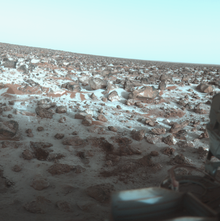 Surface of Mars as photographed by the Viking 2 lander December 9, 1977. Although the Greek-language-origin prefix geo refers to Earth, "geology" is often used in conjunction with the names of other planetary bodies when describing their composition and internal processes: examples are "the geology of Mars" and "Lunar geology". Specialised terms such as selenology (studies of the Moon), areology (of Mars), etc., are also in use. Economic geology is a branch of geology that deals with aspects of economic minerals that humankind uses to fulfill various needs. Economic minerals are those extracted profitably for various practical uses. Economic geologists help locate and manage the Earth's natural resources, such as petroleum and coal, as well as mineral resources, which include metals such as iron, copper, and uranium. Mining geology consists of the extractions of mineral resources from the Earth. 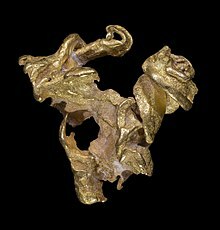 Some resources of economic interests include gemstones, metals such as gold and copper, and many minerals such as asbestos, perlite, mica, phosphates, zeolites, clay, pumice, quartz, and silica, as well as elements such as sulfur, chlorine, and helium. Petroleum geologists study the locations of the subsurface of the Earth that can contain extractable hydrocarbons, especially petroleum and natural gas. Because many of these reservoirs are found in sedimentary basins, they study the formation of these basins, as well as their sedimentary and tectonic evolution and the present-day positions of the rock units. Engineering geology is the application of the geologic principles to engineering practice for the purpose of assuring that the geologic factors affecting the location, design, construction, operation, and maintenance of engineering works are properly addressed. In the field of civil engineering, geological principles and analyses are used in order to ascertain the mechanical principles of the material on which structures are built. This allows tunnels to be built without collapsing, bridges and skyscrapers to be built with sturdy foundations, and buildings to be built that will not settle in clay and mud. A child drinks water from a well built as part of a hydrogeological humanitarian project in Shant Abak, Kenya. Geology and geologic principles can be applied to various environmental problems such as stream restoration, the restoration of brownfields, and the understanding of the interaction between natural habitat and the geologic environment. Groundwater hydrology, or hydrogeology, is used to locate groundwater, which can often provide a ready supply of uncontaminated water and is especially important in arid regions, and to monitor the spread of contaminants in groundwater wells. Geologists also obtain data through stratigraphy, boreholes, core samples, and ice cores. Ice cores and sediment cores are used to for paleoclimate reconstructions, which tell geologists about past and present temperature, precipitation, and sea level across the globe. These datasets are our primary source of information on global climate change outside of instrumental data. William Smith's geologic map of England, Wales, and southern Scotland. Completed in 1815, it was the second national-scale geologic map, and by far the most accurate of its time. The study of the physical material of the Earth dates back at least to ancient Greece when Theophrastus (372–287 BCE) wrote the work Peri Lithon (On Stones). During the Roman period, Pliny the Elder wrote in detail of the many minerals and metals then in practical use – even correctly noting the origin of amber. John Tuzo Wilson, Canadian geophysicist and father of plate tectonics. 1980 eruption of Mount St. Helens. Some modern scholars, such as Fielding H. Garrison, are of the opinion that the origin of the science of geology can be traced to Persia after the Muslim conquests had come to an end. Abu al-Rayhan al-Biruni (973–1048 CE) was one of the earliest Persian geologists, whose works included the earliest writings on the geology of India, hypothesizing that the Indian subcontinent was once a sea. Drawing from Greek and Indian scientific literature that were not destroyed by the Muslim conquests, the Persian scholar Ibn Sina (Avicenna, 981–1037) proposed detailed explanations for the formation of mountains, the origin of earthquakes, and other topics central to modern geology, which provided an essential foundation for the later development of the science. In China, the polymath Shen Kuo (1031–1095) formulated a hypothesis for the process of land formation: based on his observation of fossil animal shells in a geological stratum in a mountain hundreds of miles from the ocean, he inferred that the land was formed by erosion of the mountains and by deposition of silt. The word geology was first used by Ulisse Aldrovandi in 1603, then by Jean-André Deluc in 1778 and introduced as a fixed term by Horace-Bénédict de Saussure in 1779. The word is derived from the Greek γῆ, gê, meaning "earth" and λόγος, logos, meaning "speech". But according to another source, the word "geology" comes from a Norwegian, Mikkel Pedersøn Escholt (1600–1699), who was a priest and scholar. Escholt first used the definition in his book titled, Geologia Norvegica (1657). James Hutton is often viewed as the first modern geologist. In 1785 he presented a paper entitled Theory of the Earth to the Royal Society of Edinburgh. In his paper, he explained his theory that the Earth must be much older than had previously been supposed to allow enough time for mountains to be eroded and for sediments to form new rocks at the bottom of the sea, which in turn were raised up to become dry land. Hutton published a two-volume version of his ideas in 1795 (Vol. 1, Vol. 2). Followers of Hutton were known as Plutonists because they believed that some rocks were formed by vulcanism, which is the deposition of lava from volcanoes, as opposed to the Neptunists, led by Abraham Werner, who believed that all rocks had settled out of a large ocean whose level gradually dropped over time. The first geological map of the U.S. was produced in 1809 by William Maclure. In 1807, Maclure commenced the self-imposed task of making a geological survey of the United States. Almost every state in the Union was traversed and mapped by him, the Allegheny Mountains being crossed and recrossed some 50 times. The results of his unaided labours were submitted to the American Philosophical Society in a memoir entitled Observations on the Geology of the United States explanatory of a Geological Map, and published in the Society's Transactions, together with the nation's first geological map. This antedates William Smith's geological map of England by six years, although it was constructed using a different classification of rocks. Much of 19th-century geology revolved around the question of the Earth's exact age. Estimates varied from a few hundred thousand to billions of years. By the early 20th century, radiometric dating allowed the Earth's age to be estimated at two billion years. The awareness of this vast amount of time opened the door to new theories about the processes that shaped the planet. Some of the most significant advances in 20th-century geology have been the development of the theory of plate tectonics in the 1960s and the refinement of estimates of the planet's age. Plate tectonics theory arose from two separate geological observations: seafloor spreading and continental drift. The theory revolutionized the Earth sciences. Today the Earth is known to be approximately 4.5 billion years old. ^ Harper, Douglas. "geology". Online Etymology Dictionary. ^ Gunten, Hans R. von (1995). "Radioactivity: A Tool to Explore the Past". Radiochimica Acta. 70-71 (s1). doi:10.1524/ract.1995.7071.special-issue.305. ISSN 2193-3405. ^ "Mineral Identification Tests". Geoman's Mineral ID Tests. Retrieved 17 April 2017. ^ Hess, H.H. (November 1, 1962) "History Of Ocean Basins", pp. 599–620 in Petrologic studies: a volume in honor of A.F. Buddington. A.E.J. Engel, Harold L. James, and B.F. Leonard (eds.). Geological Society of America. ^ Kious, Jacquelyne; Tilling, Robert I. (1996). "Developing the Theory". This Dynamic Earth: The Story of Plate Tectonics. Kiger, Martha, Russel, Jane (Online ed.). Reston: United States Geological Survey. ISBN 978-0-16-048220-5. Retrieved 13 March 2009. ^ Kious, Jacquelyne; Tilling, Robert I. (1996). "Understanding Plate Motions". This Dynamic Earth: The Story of Plate Tectonics. Kiger, Martha, Russel, Jane (Online ed.). Reston, VA: United States Geological Survey. ISBN 978-0-16-048220-5. Retrieved 13 March 2009. ^ Wegener, A. (1999). Origin of continents and oceans. Courier Corporation. ISBN 978-0-486-61708-4. ^ a b Amelin, Y. (2002). "Lead Isotopic Ages of Chondrules and Calcium-Aluminum-Rich Inclusions". Science. 297 (5587): 1678–1683. Bibcode:2002Sci...297.1678A. doi:10.1126/science.1073950. PMID 12215641. ^ a b Patterson, C. (1956). "Age of Meteorites and the Earth". Geochimica et Cosmochimica Acta. 10 (4): 230–237. Bibcode:1956GeCoA..10..230P. doi:10.1016/0016-7037(56)90036-9. ^ a b c Dalrymple, G. Brent (1994). The age of the earth. Stanford, CA: Stanford Univ. Press. ISBN 978-0-8047-2331-2. ^ Levin, Harold L. (2010). The earth through time (9th ed.). Hoboken, NJ: J. Wiley. p. 18. ISBN 978-0-470-38774-0. ^ a b c Olsen, Paul E. (2001). "Steno's Principles of Stratigraphy". Dinosaurs and the History of Life. Columbia University. Retrieved 2009-03-14. ^ As recounted in Simon Winchester, The Map that Changed the World (New York: HarperCollins, 2001) pp. 59–91. ^ Tucker, R.D. ; Bradley, D.C.; Ver Straeten, C.A. ; Harris, A.G.; Ebert, J.R.; McCutcheon, S.R. (1998). "New U–Pb zircon ages and the duration and division of Devonian time" (PDF). Earth and Planetary Science Letters. 158 (3–4): 175–186. Bibcode:1998E&PSL.158..175T. CiteSeerX 10.1.1.498.7372. doi:10.1016/S0012-821X(98)00050-8. ^ Rollinson, Hugh R. (1996). Using geochemical data evaluation, presentation, interpretation. Harlow: Longman. ISBN 978-0-582-06701-1. ^ Faure, Gunter (1998). Principles and applications of geochemistry: a comprehensive textbook for geology students. Upper Saddle River, NJ: Prentice-Hall. ISBN 978-0-02-336450-1. ^ Compare: Hansen, Jens Morten (2009-01-01). "On the origin of natural history: Steno's modern, but forgotten philosophy of science". In Rosenberg, Gary D. (ed.). The Revolution in Geology from the Renaissance to the Enlightenment. Geological Society of America Memoir. 203. Boulder, CO: Geological Society of America (published 2009). p. 169. ISBN 978-0-8137-1203-1. Retrieved 2016-08-24. [...] the historic dichotomy between 'hard rock' and 'soft rock' geologists, i.e. scientists working mainly with endogenous and exogenous processes, respectively [...] endogenous forces mainly defining the developments below Earth's crust and the exogenous forces mainly defining the developments on top of and above Earth's crust. ^ Compton, Robert R. (1985). Geology in the field. New York: Wiley. ISBN 978-0-471-82902-7. ^ "USGS Topographic Maps". United States Geological Survey. Retrieved 2009-04-11. ^ Burger, H. Robert; Sheehan, Anne F.; Jones, Craig H. (2006). Introduction to applied geophysics : exploring the shallow subsurface. New York: W.W. Norton. ISBN 978-0-393-92637-8. ^ Krumbein, Wolfgang E., ed. (1978). Environmental biogeochemistry and geomicrobiology. Ann Arbor, MI: Ann Arbor Science Publ. ISBN 978-0-250-40218-2. ^ McDougall, Ian; Harrison, T. Mark (1999). Geochronology and thermochronology by the ♯°Ar/©Ar method. New York: Oxford University Press. ISBN 978-0-19-510920-7. ^ Hubbard, Bryn; Glasser, Neil (2005). Field techniques in glaciology and glacial geomorphology. Chichester, England: J. Wiley. ISBN 978-0-470-84426-7. ^ Nesse, William D. (1991). Introduction to optical mineralogy. New York: Oxford University Press. ISBN 978-0-19-506024-9. ^ Morton, A.C. (1985). "A new approach to provenance studies: electron microprobe analysis of detrital garnets from Middle Jurassic sandstones of the northern North Sea". Sedimentology. 32 (4): 553–566. Bibcode:1985Sedim..32..553M. doi:10.1111/j.1365-3091.1985.tb00470.x. ^ Zheng, Y; Fu, Bin; Gong, Bing; Li, Long (2003). "Stable isotope geochemistry of ultrahigh pressure metamorphic rocks from the Dabie–Sulu orogen in China: implications for geodynamics and fluid regime". Earth-Science Reviews. 62 (1): 105–161. Bibcode:2003ESRv...62..105Z. doi:10.1016/S0012-8252(02)00133-2. ^ Condomines, M; Tanguy, J; Michaud, V (1995). "Magma dynamics at Mt Etna: Constraints from U-Th-Ra-Pb radioactive disequilibria and Sr isotopes in historical lavas". Earth and Planetary Science Letters. 132 (1): 25–41. Bibcode:1995E&PSL.132...25C. doi:10.1016/0012-821X(95)00052-E.
^ Shepherd, T.J.; Rankin, A.H.; Alderton, D.H.M. (1985). A practical guide to fluid inclusion studies. Mineralogical Magazine. 50. Glasgow: Blackie. p. 352. Bibcode:1986MinM...50..352P. doi:10.1180/minmag.1986.050.356.32. ISBN 978-0-412-00601-2. ^ Sack, Richard O.; Walker, David; Carmichael, Ian S.E. (1987). "Experimental petrology of alkalic lavas: constraints on cotectics of multiple saturation in natural basic liquids". Contributions to Mineralogy and Petrology. 96 (1): 1–23. Bibcode:1987CoMP...96....1S. doi:10.1007/BF00375521. ^ McBirney, Alexander R. (2007). Igneous petrology. Boston: Jones and Bartlett Publishers. ISBN 978-0-7637-3448-0. ^ Spear, Frank S. (1995). Metamorphic phase equilibria and pressure-temperature-time paths. Washington, DC: Mineralogical Soc. of America. ISBN 978-0-939950-34-8. ^ Dahlen, F A (1990). "Critical Taper Model of Fold-And-Thrust Belts and Accretionary Wedges". Annual Review of Earth and Planetary Sciences. 18: 55–99. Bibcode:1990AREPS..18...55D. doi:10.1146/annurev.ea.18.050190.000415. ^ Gutscher, M; Kukowski, Nina; Malavieille, Jacques; Lallemand, Serge (1998). "Material transfer in accretionary wedges from analysis of a systematic series of analog experiments". Journal of Structural Geology. 20 (4): 407–416. Bibcode:1998JSG....20..407G. doi:10.1016/S0191-8141(97)00096-5. ^ Koons, P O (1995). "Modeling the Topographic Evolution of Collisional Belts". Annual Review of Earth and Planetary Sciences. 23: 375–408. Bibcode:1995AREPS..23..375K. doi:10.1146/annurev.ea.23.050195.002111. ^ Dahlen, F.A. ; Suppe, J.; Davis, D. (1984). "Mechanics of Fold-and-Thrust Belts and Accretionary Wedges: Cohesive Coulomb Theory". J. Geophys. Res. 89 (B12): 10087–10101. Bibcode:1984JGR....8910087D. doi:10.1029/JB089iB12p10087. ^ a b c d Hodell, David A.; Benson, Richard H.; Kent, Dennis V.; Boersma, Anne; Rakic-El Bied, Kruna (1994). "Magnetostratigraphic, Biostratigraphic, and Stable Isotope Stratigraphy of an Upper Miocene Drill Core from the Salé Briqueterie (Northwestern Morocco): A High-Resolution Chronology for the Messinian Stage". Paleoceanography. 9 (6): 835–855. Bibcode:1994PalOc...9..835H. doi:10.1029/94PA01838. ^ Bally, A.W., ed. (1987). Atlas of seismic stratigraphy. Tulsa, OK: American Association of Petroleum Geologists. ISBN 978-0-89181-033-9. ^ Fernández, O.; Muñoz, J.A. ; Arbués, P.; Falivene, O.; Marzo, M. (2004). "Three-dimensional reconstruction of geological surfaces: An example of growth strata and turbidite systems from the Ainsa basin (Pyrenees, Spain)". AAPG Bulletin. 88 (8): 1049–1068. doi:10.1306/02260403062. ^ Poulsen, Chris J.; Flemings, Peter B.; Robinson, Ruth A. J.; Metzger, John M. (1998). "Three-dimensional stratigraphic evolution of the Miocene Baltimore Canyon region: Implications for eustatic interpretations and the systems tract model". Geological Society of America Bulletin. 110 (9): 1105–1122. Bibcode:1998GSAB..110.1105P. doi:10.1130/0016-7606(1998)110<1105:TDSEOT>2.3.CO;2. ^ Toscano, M; Lundberg, Joyce (1999). "Submerged Late Pleistocene reefs on the tectonically-stable S.E. Florida margin: high-precision geochronology, stratigraphy, resolution of Substage 5a sea-level elevation, and orbital forcing". Quaternary Science Reviews. 18 (6): 753–767. Bibcode:1999QSRv...18..753T. doi:10.1016/S0277-3791(98)00077-8. ^ Selley, Richard C. (1998). Elements of petroleum geology. San Diego: Academic Press. ISBN 978-0-12-636370-8. ^ Das, Braja M. (2006). Principles of geotechnical engineering. England: Thomson Learning. ISBN 978-0-534-55144-5. ^ a b Hamilton, Pixie A.; Helsel, Dennis R. (1995). "Effects of Agriculture on Ground-Water Quality in Five Regions of the United States". Ground Water. 33 (2): 217–226. doi:10.1111/j.1745-6584.1995.tb00276.x. ^ Seckler, David; Barker, Randolph; Amarasinghe, Upali (1999). "Water Scarcity in the Twenty-first Century". International Journal of Water Resources Development. 15: 29–42. doi:10.1080/07900629948916. ^ Welch, Alan H.; Lico, Michael S.; Hughes, Jennifer L. (1988). "Arsenic in Ground Water of the Western United States". Ground Water. 26 (3): 333–347. doi:10.1111/j.1745-6584.1988.tb00397.x. ^ Barnola, J.M. ; Raynaud, D.; Korotkevich, Y.S. ; Lorius, C. (1987). "Vostok ice core provides 160,000-year record of atmospheric CO2". Nature. 329 (6138): 408–414. Bibcode:1987Natur.329..408B. doi:10.1038/329408a0. ^ Colman, S.M. ; Jones, G.A. ; Forester, R.M. ; Foster, D.S. (1990). "Holocene paleoclimatic evidence and sedimentation rates from a core in southwestern Lake Michigan". Journal of Paleolimnology. 4 (3): 269. Bibcode:1990JPall...4..269C. doi:10.1007/BF00239699. ^ Jones, P.D. ; Mann, M.E. (6 May 2004). "Climate over past millennia" (PDF). Reviews of Geophysics. 42 (2): RG2002. Bibcode:2004RvGeo..42.2002J. doi:10.1029/2003RG000143. ^ a b Winchester, Simon (2002). The map that changed the world: William Smith and the birth of modern geology. New York: Perennial. ISBN 978-0-06-093180-3. ^ Asimov, M.S. ; Bosworth, Clifford Edmund (eds.). The Age of Achievement: A.D. 750 to the End of the Fifteenth Century : The Achievements. History of civilizations of Central Asia. pp. 211–214. ISBN 978-92-3-102719-2. ^ Al-Rawi, Munin M. (November 2002). The Contribution of Ibn Sina (Avicenna) to the development of Earth Sciences (PDF) (Report). Manchester, UK: Foundation for Science Technology and Civilisation. Publication 4039. ^ Needham, Joseph (1986). Science and Civilisation in China. Vol. 3. Taipei: Caves Books, Ltd. pp. 603–604. ISBN 978-0-521-31560-9. ^ Vai, Gian Battista; Cavazza, William (2003). Four centuries of the word geology: Ulisse Aldrovandi 1603 in Bologna. Minerva. ISBN 978-88-7381-056-8. Zittel, Karl Alfred von, with Maria M. Ogilvie-Gordon, trans., History of Geology and Paleontology to the End of the Nineteenth Century (London, England: Walter Scott, 1901), p. 76. Geikie, Archibald, The Founders of Geology, 2nd ed. (London, England: Macmillan and Co., 1905), p. 186. Eastman, Charles Rochester (12 August 1904) Letter to the Editor: "Variæ Auctoritatis", Science, 2nd series, 20 (502) : 215–217 ; see p. 216. Emmons, Samuel Franklin (21 October 1904) Letter to the Editor: "Variæ Auctoritatis", Science, 2nd series, 20 (512) : 537. Eastman, C.R. (25 November 1904) Letter to the Editor: "Notes on the History of Scientific Nomenclature," Science, 2nd series, 20 (517) : 727–730 ; see p. 728. Emmons, S.F. (23 December 1904) Letter to the Editor: "The term 'geology' ", Science, 2nd series, 20 (521) : 886–887. Eastman, C. R. (20 January 1905) Letter to the Editor: "Deluc's 'Geological Letters'", Science, 2nd series, 21 (525): 111. Emmons, S. F. (17 February 1905) Letter to the Editor: "Deluc versus de Saussure", Science, 2nd series, 21 (529) : 274–275. ^ Winchester, Simon (2001). The Map that Changed the World. HarperCollins Publishers. p. 25. ISBN 978-0-06-093180-3. Reprinted in English as: Escholt, Michel Pedersøn with Daniel Collins, trans., Geologia Norvegica … (London, England: S. Thomson, 1663). ^ Kermit H., (2003) Niels Stensen, 1638–1686: the scientist who was beatified. Gracewing Publishing. p. 127. ^ Maclure, William (1817). Observations on the Geology of the United States of America: With Some Remarks on the Effect Produced on the Nature and Fertility of Soils, by the Decomposition of the Different Classes of Rocks; and an Application to the Fertility of Every State in the Union, in Reference to the Accompanying Geological Map. Philadelphia: Abraham Small. ^ Greene, J.C.; Burke, J.G. (1978). "The Science of Minerals in the Age of Jefferson". Transactions of the American Philosophical Society. New Series. 68 (4): 1–113 . doi:10.2307/1006294. JSTOR 1006294. ^ Lyell, Charles (1991). Principles of geology. Chicago: University of Chicago Press. ISBN 978-0-226-49797-6. ^ England, Philip; Molnar, Peter; Richter, Frank (2007). "John Perry's neglected critique of Kelvin's age for the Earth: A missed opportunity in geodynamics". GSA Today. 17: 4. doi:10.1130/GSAT01701A.1. more and teach others about Geology at the School of Geology. One Geology: This interactive geologic map of the world is an international initiative of the geological surveys around the globe. This groundbreaking project was launched in 2007 and contributed to the 'International Year of Planet Earth', becoming one of their flagship projects.